Must book 3 weeks in advance! Included: Table and Chairs. Themed paper goods. 1/2 sheet themed cake and juice boxes for 20 kids. Choose from current popular themes, sports themes, polka-dots, zebra, unicorns, and more for paper goods. For your cake, pick your flavor, theme, and icing! Set-up, activities ,and clean-up is also provided. Must book 2 weeks in advance! Included: Your choice of single colored paper goods. Pick your own color! Table and chairs. You must provide your own juice boxes and your own cake. We also provide set-up, activities, and clean-up. Included: Tables and Chairs. You bring your own supplies but we do provide the activities and clean up! Download the Release & Liability Form HERE! 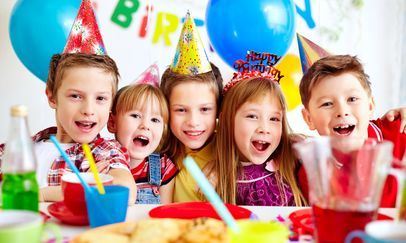 All participating party guests must have a release form completed by parent/guardian in order to participate in activities, games, and play.